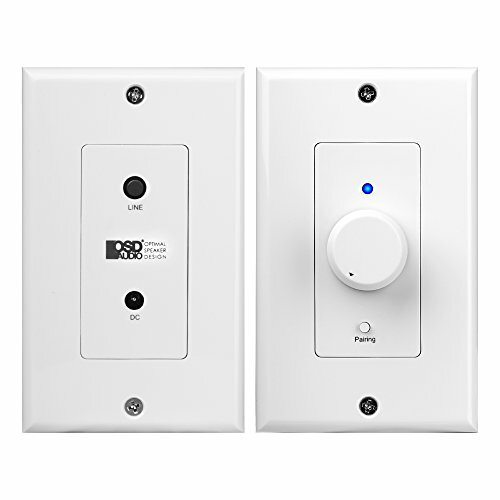 OSD Audio’s Bluetooth-ready in-wall volume control with amplification lets you control the audio remotely through your cellphone, tablet or computer and enjoy whole house audio without the need of a separate amplifier or receiver. OSD Audio’s XWB50 In-wall Volume Control provides the convenience of Bluetooth control within an unobtrusive and easy-to install system. Packed with features, this in-wall VC includes a 50W amplifier so there’s no need to power it through a separate source. Imagine sitting in the living room and using your cellphone to raise or lower the volume of your whole house audio system, or control the volume directly from the rotary knob. The XWB50 also includes a 3.5mm aux input to connect to devices directly, which is a handy feature for those times when Bluetooth is not available or a bit sketchy. This Bluetooth-ready volume control unit includes a Decora-style plate and can be mounted in proximity to a standard outlet. The amplifier also mounts in the wall and can be installed out of sight near the outlet. All connecting cables, power supply and cord are included so no last-minute trips to the hardware store. The built-in Bluetooth receiver has a wireless range up to 32.8 feet (10m) so you can walk around the room and tweak the volume from your cellphone or tablet. Designed with precision electronics to provide low distortion and a flat frequency response, the XWB50 installs easily and works with virtually any audio system and you don’t need to be an electrician or even that handy to install the unit.